Oh, I'm so sorry for neglecting this blog! We are all doing very well....in fact, here's a look into how awesome Ellie's doing! She performed in her first dance recital yesterday and she was BRILLIANT! Just look at her! Ellie and I went on a little adventure last week! Or, at least, I tried to make it SEEM like a fun and exciting adventure….because not everyone would consider 6 doctor and therapist appointments in 2 days something to cheer about. But, if MOMMY makes it sound thrilling, then it MUST be, right? Yup. Uh huh. Little Miss Jelly B’Ellie and I flew our way to Vancouver for a few days because we had 2 jam-packed days of SDR follow-up appointments. Again, can you believe it’s already been (over!) a year since her surgery? Crazy. I was a bit nervous, travelling as a single parent, but thanks to all your prayers and love, it worked out fine. I have come to the conclusion that there are many, many good people in this world. Without their help, this trip would have been much tougher. So, the next time you see a frazzled mom trying to carry a 48-pound 5-year-old while attempting to unfold a stroller AND a walker, help her out. Just like so many strangers did for me! *Radiology. Ellie needed x-rays of her hips. Thankfully, she does really well with x-rays. Because she has ‘em quite often. In fact, she thinks it’s pretty funny when mommy has to wear the “weird coat”. My life was made so much easier by BC Children's Hospital and all their waiting-room toys! *Occupational Therapy. 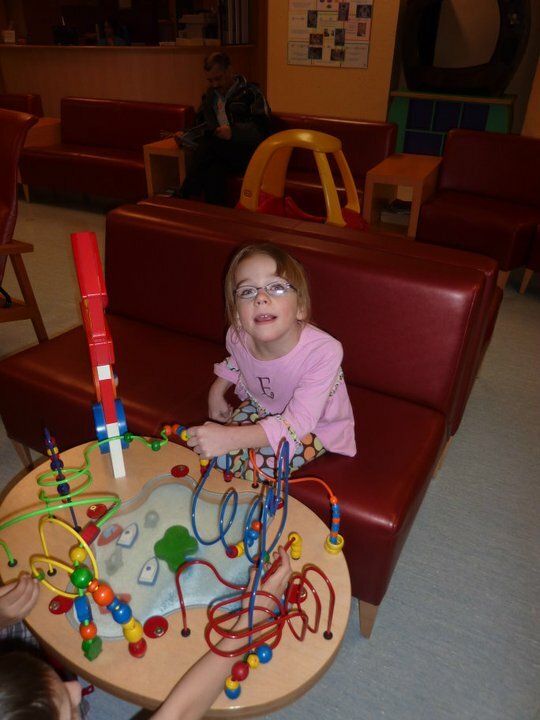 A few days before Ellie’s surgery last year, the OT conducted a test of Ellie’s fine motor skills. She then administered the same test last week, to see if there was any improvement. 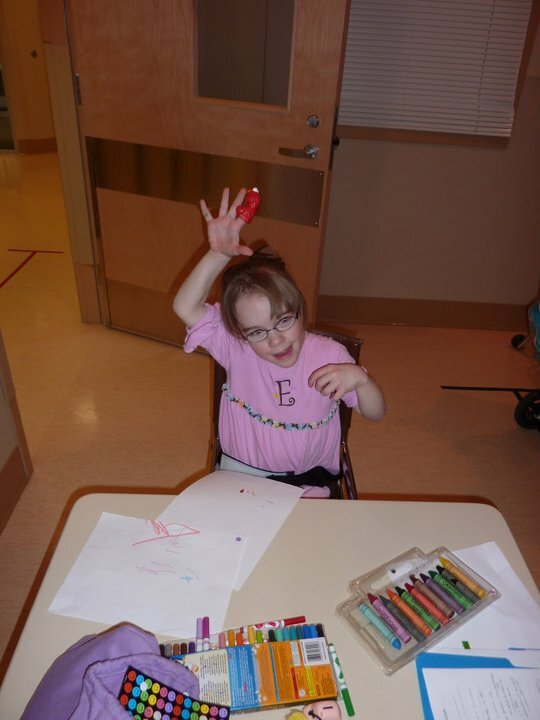 Ellie had a great time with this test because it involved her favorite things: markers, stickers and finger puppets! Unfortunately, I didn’t get the results back from the OT. However, I know that Ellie’s has improved greatly in this area, which is especially encouraging for school. There is LOTS of fine motor work required at school! I think her head is going to explode: An ELMO finger puppet?! Too much happiness! *Physical Therapy. Again, last year, before the surgery, the PT conducted a test to see where Ellie was at with her gross motor skills (walking, sitting, standing, etc). This test is a bit more laborious (ie: not nearly as fun) and LONG. It was one-and-a-half hours of intense testing, and Ellie was SPENT by the end of it! BUT, the PT compared some notes from last year and there was marked improvement across the board! He was especially impressed with her adductor muscles (thighs). Those were the tightest pre-SDR, and now they’re so much looser. That, of course, results in easier walking. 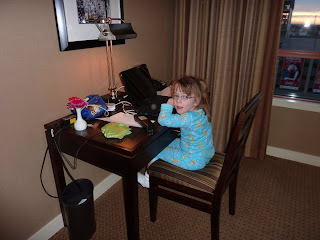 And then emailing Daddy....that's my girl! *Dr. Beauchamp. He is the orthopedic surgeon. This was the appointment I was dreading and anticipating most. When we were researching Ellie’s candidacy for SDR, several doctors and therapists suggested that we do hip surgery BEFORE the rhizotomy. Ellie’s hips did not look good. In fact, the right hip was 60% out of the socket. The tight muscles in Ellie’s adductors were pulling her hips out of place. Dr. Beauchamp thought we should go ahead with the SDR first, and then see if that would make a difference in her hips. He thought that her hip might possibly move back into the socket a LITTLE bit, but our real hope was that it didn’t pull out further. At 60%, we could probably hold off on hip surgery for a few more years. Well….when Dr. Beauchamp saw Ellie’s new hip x-ray, his jaw about dropped. Ellie’s right hip is now less than 40% out of the socket!! This is miraculous improvement! I cried. I was so nervous that he’d recommend hip surgery, and the thought alone made me want to puke. But, no! Dr. Beauchamp said that he’d never seen such marked improvement and suggested there was possibility for further alignment. Thank You Jesus! And thank you to everyone who prayed so hard with us! Of course, Ellie and her team of therapists and conductors have worked SO HARD this year, and it’s amazing to see the results. Thank you to each and everyone of you! *Gait Lab. I was almost walking on air when we got down to the gait lab, after our appointment with Dr. Beauchamp. 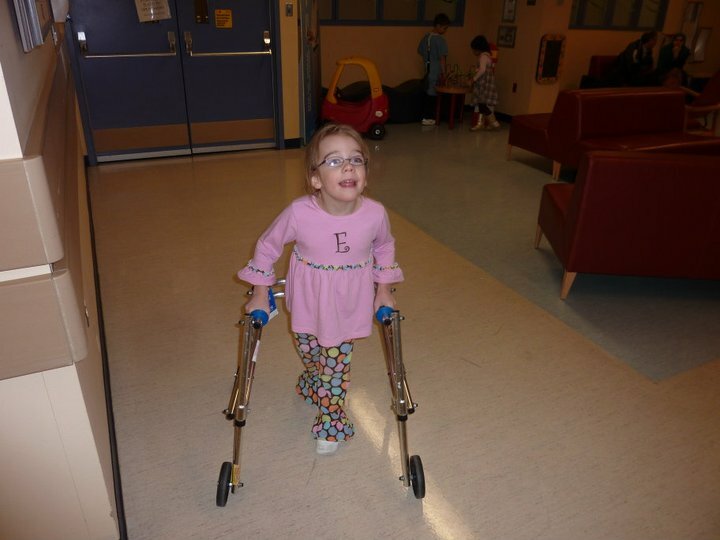 Last year, the therapists at the gait lab videoed Ellie walking and through that footage, they were able to measure how each muscle was working. So, they wanted a NEW tape of the Ellie’s NEW gait. They, too, were very impressed with the changes. It was wonderful to see! Sooo happy to be done with all the appointments and on her way HOME! And, then, it was time for Ellie and I to jet back home. We were VERY happy to see Richard and his strong arms at the airport! So, in a nutshell, all the news was VERY GOOD! We will continue to work hard, of course. The doctors and therapists expect to see continued improvement for the next few years…and beyond! 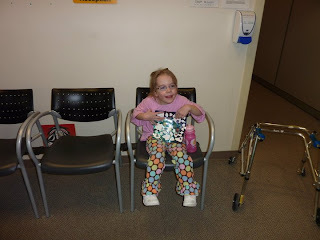 It’s been an entire year since Ellie’s Selective Dorsal Rhizotomy surgery! Can you believe it? Neither can I! I thought that this anniversary called for a look back at some of the surgery results we’ve witnessed. Of course, it’s always hard to discern if the feat came as a result of the surgery, the therapy afterward, Ellie’s growth, or a mix of all three. I think that the reduction in spasticity (a direct and immediate result of the SDR) was a catalyst for most of Ellie’s physical progress this year. *Ellie can now sit crossed-legged for 20 + minutes at a time. She still needs some assistance to get her legs into this position, but once in place, she can sit beautifully. 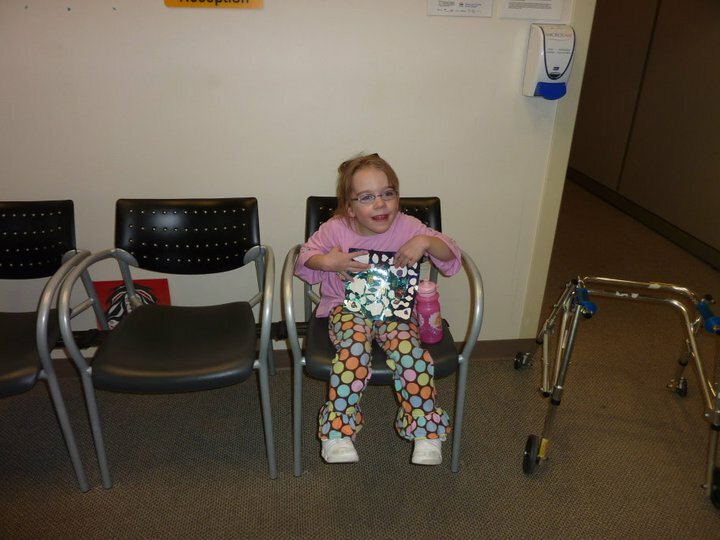 Before the SDR, her thigh muscles were so tight that it was impossible (and painful) to sit crossed-legged. Of course, it's such a blessing that Ellie’s now able to do this, because kindergarteners spend a lot of time on the floor, listening to stories, in this position! *Ellie doesn’t need to use her AFOs to walk flat-footed anymore. Ellie’s ankles have always (surprisingly) had a decent range of motion, but we noticed an even further improvement after the SDR. All of her doctors and therapists say that she only needs to wear her AFOs when she sleeps. Ellie plants her feet flat while walking (unless she’s really tired), which is wonderful! *Ellie hardly ever crosses (scissors) her legs while walking anymore! This was a huge hindrance to further progress before the SDR. The spasticity in her hips and legs would pull her legs across one another and she would constantly scissor as she walked. But, we noticed a MARKED improvement in this as soon as she started walking again after the surgery. While some of her spasticity has returned (Dr. Steinbok predicted this would happen), she rarely scissors anymore (we only notice it when she’s tired or when she’s really excited and tries to “run”). *Ellie can sit independently on her potty seat. Believe it or not, this is a HUGE milestone! Everyone would rather “do their business” in private, and now, after helping her onto her seat, we can leave Ellie alone in the bathroom. We were unable to do this before SDR, because the spasticity in her legs would cause her to extend, and she would fall off the seat if not holding onto our hands. *Ellie is a master in her walker! 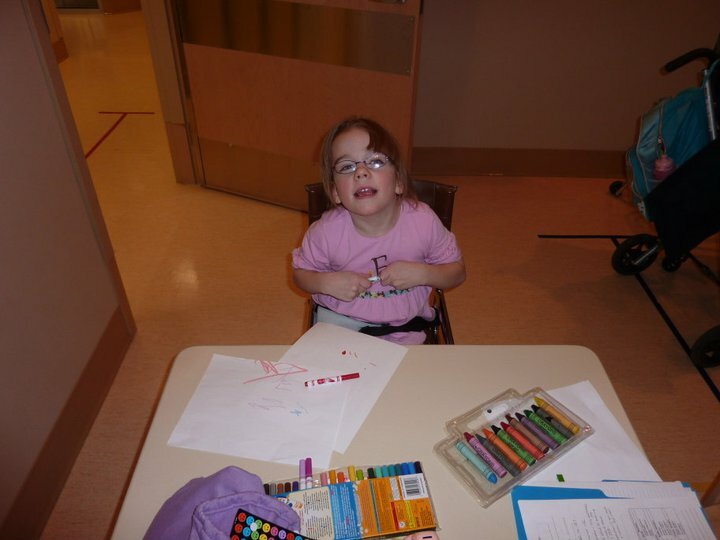 This is a skill that was aided by the SDR, but honed through therapy and rehab. She amazes me almost daily, with how she’s able to navigate around tight spots or turns. Her stamina has also grown tremendously this year (again, probably as a result of both the surgery AND intensive therapy). She gets mad at us when we keep asking her if she’s “tired and wants to ride in her stroller”! *Ellie has started walking independently with her canes. This is a VERY slow process, but the fact that she’s taking ANY independent steps with her canes is a testament to her hard work and determination! My hope is that by 2nd grade, she will be using her canes at school. Wouldn’t that be fantastic?! 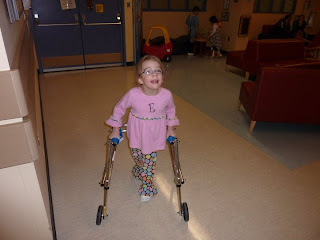 *Ellie’s balance has really improved and she’s now able to reach for things with only one hand on her walker. 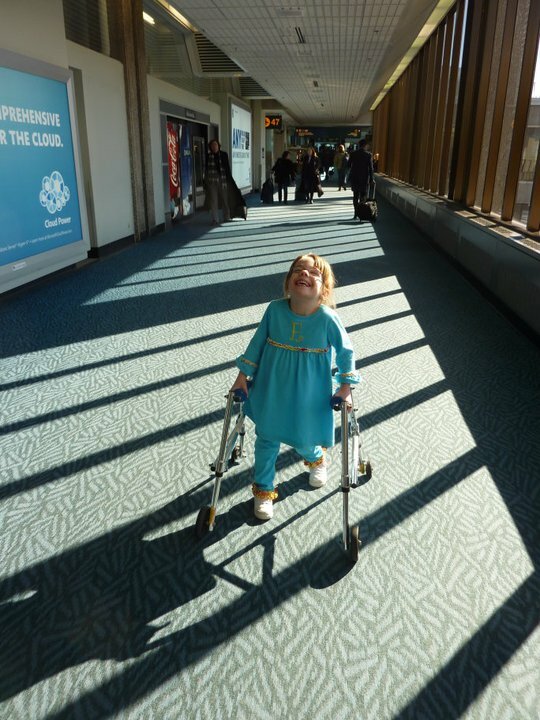 This is a major milestone, too, as it gives her another level of independence. She can shake people’s hands now, while standing in her walker! 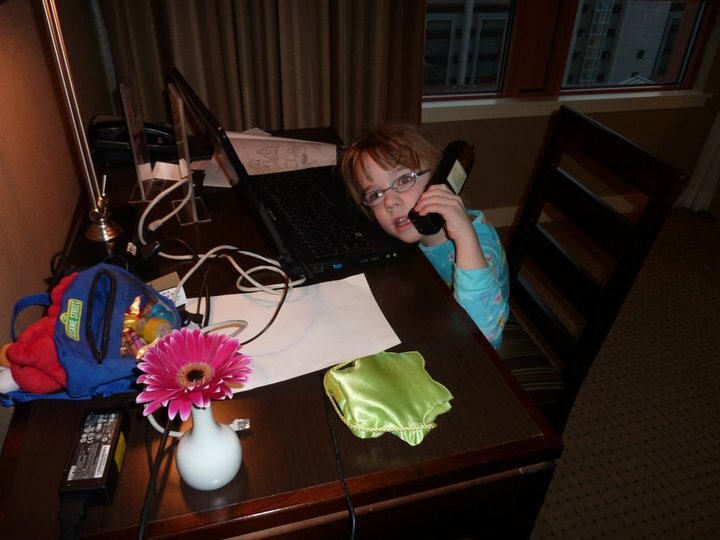 A little politician in the making (a girl after my own heart!). Of course, Ellie has progressed in so many other areas of her life (speech, hand dexterity, emotional maturity, etc), but these are the ones that I think are most related to the SDR surgery. Several people have asked me if we’re happy with the results and if the surgery was worth it. Admittedly, in my heart I was hoping that Ellie would be walking everywhere with canes by now, but she’s accomplished SO MUCH in the past year, that I don’t want anyone to think that I’m one bit disappointed in my Superstar. She is AMAZING! And, this is only year ONE! Here’s to another amazing Year TWO! Look what happened to (not so) Little Miss Ellie over Christmas vacation! Yup, she was visited by both Santa AND the Tooth Fairy! At first, Ellie was very nervous about the Tooth Fairy's visit. "Is she going to wake me up?" "What does she look like?" "How will she get in the house?" "What kind of car does she drive?" But, when she woke up in the morning, she was very excited and exclaimed, "The Tooth Fairy looked just like Daddy!" HA! 'Course, it's bitter sweet for me. My baby's growing up! We're trying to make the best out of winter, but I sure do miss me some Florida right about now! Well, here we are, in the throws of another Christmas season. Two pageants and one family gathering down! It's been a lot of fun, but it will also be nice to spend some quiet time as our little family. And, by "quiet" time, I mean watching football and playing Tinkerbell Bingo, of course. Ellie started off the holiday craziness with her Kindergarten Christmas program. She, of course, was precious. Nervous and a tad overwhelmed, but precious nonetheless :-). On her way to the gym for her big elementary school debut! Getting in on the actions! We decided it would be best for Ellie to sit in her chair while on stage, because she can't use her hands very well when using her walker. And, as you can see in this picture, she really needed to have her hands free! Next on the agenda was our first family party. And when I say party, I mean PAR-TAY! Ellie has so much fun with her little cousins, and we have fun watching her. And, you know, we're kind of in love with our family. They are the definition of support and unconditional love. Cheesy, but true. She said it, she said it! How pickin' precious are these two?! Cousin Zach came out to cheer Ellie on. I take full credit for the matching outfits. I couldn't help myself. Awwww....You think Grandma will make a copy of this for her fridge? That's a no-brainer! From our busy Christmas house to yours...MERRY week-before Christmas!